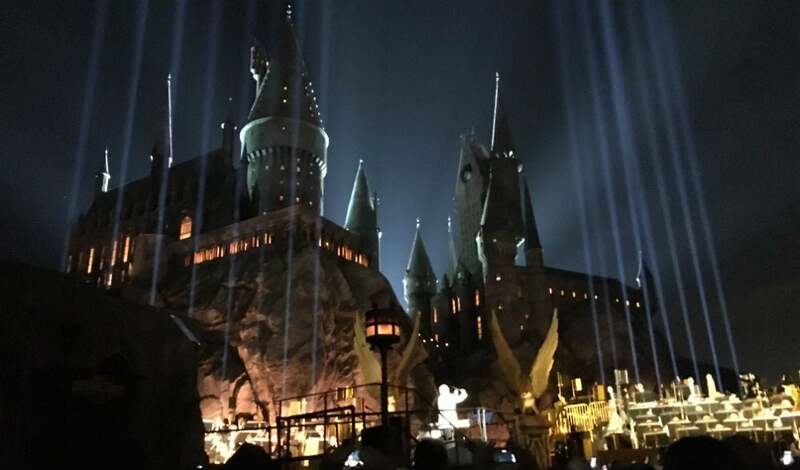 Video: Tuesday night in Los Angeles, Universal Studios Hollywood held a huge celebration for the opening of their new Wizarding World of Harry Potter. The highlight was John Williams himself, conducting the Los Angeles Philharmonic, in the shadow of Hogwarts — and you can watch it here. The video below is courtesy of Inside the Magic. It's a 33-minute video of the entire presentation, but if we're being honest, you're going to want to jump to about 23 minutes 25 seconds. That's when Williams took the stage and, well, from there it was a life-affirming experience. I was in attendance and to be that close to Williams himself, hear his beautiful music in this majestic location, it was as magical as you'd expect from something tied to Harry Potter. Another highlight is the amazing projection that was put on Hogwarts Castle towards the very end of the event. Each house got its own special presentation and set of fireworks, so be sure to keep watching for that that. The Wizarding World of Harry Potter opens to the public April 7 at Universal Studios Hollywood. If you're a Harry Potter fan and haven't been able to get to Orlando or Japan, you should certainly plan a visit. Top image: John Williams conducting at the Wizarding World of Harry Potter.